Enterprise security and protection has suddenly become a major concern and a Board-level issue following the September 11terrorist attacks, the major corporate scandals at ENRON, MCI and others, and the need to recognize enterprise protection as an integral part of doing business in a global threat environment. Changes in the business models that include externalization of the business and outsourcing of applications, information processing and network connectivity with remote access are a worldwide phenomenon as organizations seek to enter the e-commerce and the business-to-business (B2B) commerce field as soon as possible. All these circumstances breed new opportunties for a wide range of enterprise exposures. Todays enterprises now have highly fractionated organizational structures and insular and myopic provisions to deal with the new global threat environment which leaves them highly exposed to losses and business disruptions. Enterprise protection and security is serious need of overhaul. Consequently, all types of organizations, need to assess and restructure their enterprise-wide risk assessment, protection and security provisions to ensure they are able to cope with the plethora of new world threats and uncontrollable disasters, especially in view of recent corporate governance legislation. c) Preparing a detailed action plan for developing, implementing and managing a reengineered enterprise protection program. MAP-54 is the only professional publication on the subject with best practices and a plan of action to ensure that your enterprise is well protected in todays complex and global threat environment. Whether you area CEO, CSO, CIO, CFO, Internal Auditor or risk management executive, legal counsel, audit, and contingency planning or compliance officer professional, this manual is for you and belongs in your practitioners bookshelf. The manual was prepared by practitioners for practitioners and avoids confusing technical terminology. 1. Chances Are Your Enterprises Protection and Risk Management Programs Are Highly Fractionated with a Silo Mentality. 2. Present Deficiencies in Enterprise Risk Management, Security and Protection. 3. If You Do Not Know Where You Are, Any Security/Protection Program Will Get You There. 4. Centralizing Security Planning and Architecturing While Decentralizing Execution. 5. 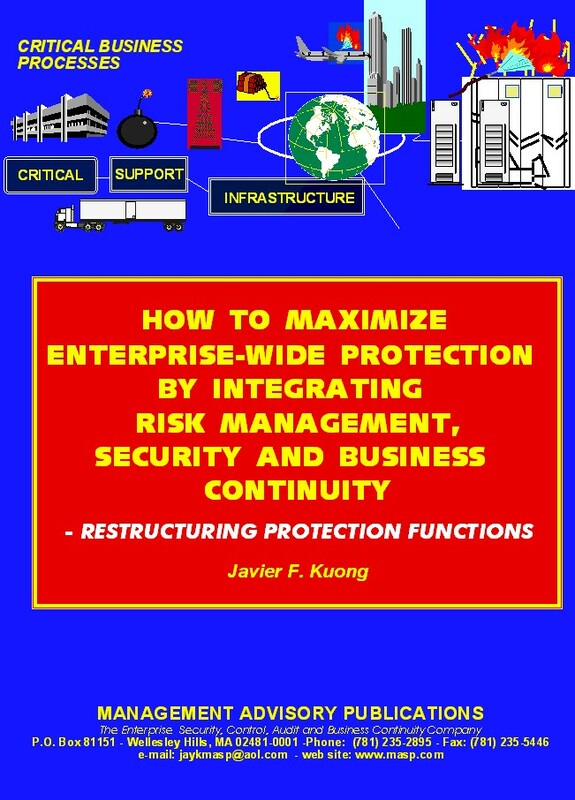 A Detailed Plan of Action to Restructure and Improve Enterprise Protection, Security and Risk Management. PREPAID PRICE: $150 in the US, $190 overseas, includes postage. NOTE: This manual covers all the key aspects of how to improve risk management, enterprise protection and security in todays changed risk panorama.